Find out why Charlotte loves the Hanskin Hyaluron Skin Essence! Stories From a Curator is a column by Charlotte Cho, the curator and cofounder of Soko Glam. As a licensed esthetician and the author of The Little Book of Skin Care, Cho gives a glimpse into her discovery process and what brands and products make the cut for the curated site. Curating essences has been a tough one for me. There’s a reason why there aren’t many options on Soko Glam even though I’ve been curating products nonstop for the past four years. It’s a category I take seriously, because essences are the heart of my skin routine and when I fell in love with K-beauty, a big part of it had to do with my very first essence. I’m pretty picky about essences, too. The first thing I look at is the consistency. Because this is a step I use after toning and before other thicker treatments, like serums and ampoules, I like my essences to be very lightweight and watery. The second requirement for my essence is for it to be fragrance-free, or if it has a slight fragrance, it shouldn’t linger and be as natural as possible. I don’t have an issue with fragrance in general, it’s just that if I’m going to layer on three to four products on my skin, I want my base skin care steps as fragrance-free as possible. When I started testing the Hanskin Hyaluron Skin Essence, it passed my requirements with flying colors. It was very lightweight in consistency (just slightly thicker than the Missha First Treatment Essence), and it also has no added fragrance. I also loved the innovative concept behind it. It doesn’t fit into one category—it’s actually a hybrid product. It’s called a “Hyaluron Skin Essence” because it’s not just an essence, it’s also “skin,” which is the term used for toner in Korea. In a nutshell, this Skin Essence is basically a layerable toner, treatment, and moisturizer, which all work to boost your hydration levels and keep you moisturized all day. As a hybrid product, I consider this a multi-functional product that can be used in many steps in your routine. These are the two ways you can use it. Use it alone as your essence step after your toner. After cleansing, splash the Skin Essence on your fingertips and onto your face to pat in as a toning step. Wait a minute for it to absorb and then layer it on your skin as the essence step. Add your treatment products such as eye cream and serum. Wait a minute longer, and then layer it on as a light emulsion. Last is sunscreen, if you’re going out. The layerable consistency of the essence makes it perfect for different kinds of use. It locks in the moisture from the previous layer and can be great for dry skin types, but also for oily skin types who hate oil-based moisturizers that clog pores and make you look like an oil slick. Plus, this essence layering method is quite popular in Korea, and I’ve become obsessed with it. To clarify, this product really isn’t about the brightening aspect that some essences provide. It’s all about moisture. Sodium hyaluronate (a great moisturizing ingredient that molecularly penetrates into the skin better) and hyaluronic acid, along with hydrolyzed collagen, boosts your moisture levels. In turn, your skin will be plump and dewy. It will feel elastic to the touch! To me, the Hanskin Hyaluron Skin Essence is a clear winner. 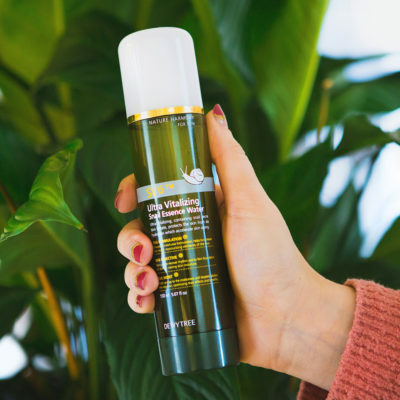 It not only functions as an amazing hydrating essence, but the consistency is perfect for layering it once and even three to four times for triple or quadruple the moisture. This makes it absolutely perfect for the warmer weather that’s just around the corner! For more on the Hanskin brand, click here. + What do you look for in an essence? Let me know in the comments!